Vienna’s Romanesque Revival courthouse was completed in 1892. It originally featured a spire, which was later removed due to structural concerns. William H. Parkins was the architect. 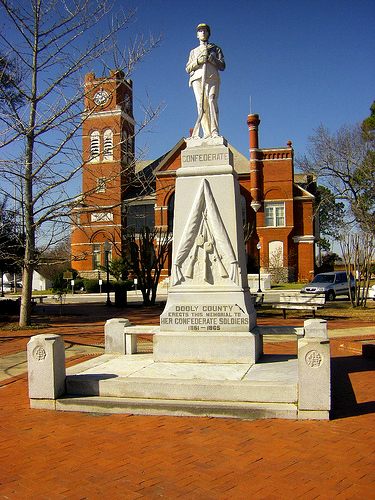 The confederate monument was dedicated by Dooly County’s surviving veterans and the Vienna United Daughters of the Confederacy Chapter 1097 on 26 November 1908. The kepi on the soldier is a rare authentic feature absent from most confederate monuments, but nearly as rare is the fact that a woman was the principal speaker at the dedication. Miss Mae Forehand was a rousing orator, according to accounts of the day. Source: Frank M. McKenney, The Standing Army: History of Georgia’s County Confederate Monument, W. H. Wolfe Associates, Alpharetta, 1993. Brian I have been looking for any information on a school clost to Tippitville Georgia. In Dooly County Georgia. It was named Dooly High But catered to all grades in the fifty’s I found that it was built in ninteen and thirty and abandoned in the sixty’s. The school is no longer there and for the life of me I cannot find a picture of it. If you can help it sure will bless an old mans heart.